My mother is an expert banana bread baker. My brothers and I grew up with Mom baking it on a fairly regular basis. It’s a great way to use up overripe (not rotten) bananas, heat up the house on a cold day, and offer a sweet treat for her family. Preheat oven to 350 degrees F. Grease and flour two loaf pans. Sift together dry ingredients. Combine with the rest of the ingredients. Mix at medium speed until well mixed. (I just mixed with a big kitchen spoon.) Bake 55 to 65 minutes. Cool before slicing. Makes 2 loaves. From D. J. Cochran. After a few minutes I take the loaves out of their pans and let them cool on a wire rack. 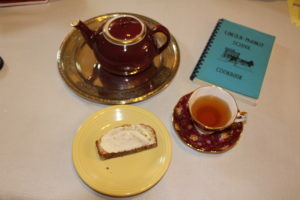 Enjoying banana bread and cranberry/orange tea on a cold autumn day. The famous Lincoln-McKinley cookbook is to the upper right. One of my favorite things to do is mix Fiesta with other china patterns; a P86 Yellow salad plate is paired with Royal Albert’s Old Country Roses Ruby Lace tea cup and saucer and “Leona Helmsley’s” Mayer china tea pot on a silver plated platter by Wilcox Silver Plate Company.